Today I am moving from France to Ireland for my featured artist. 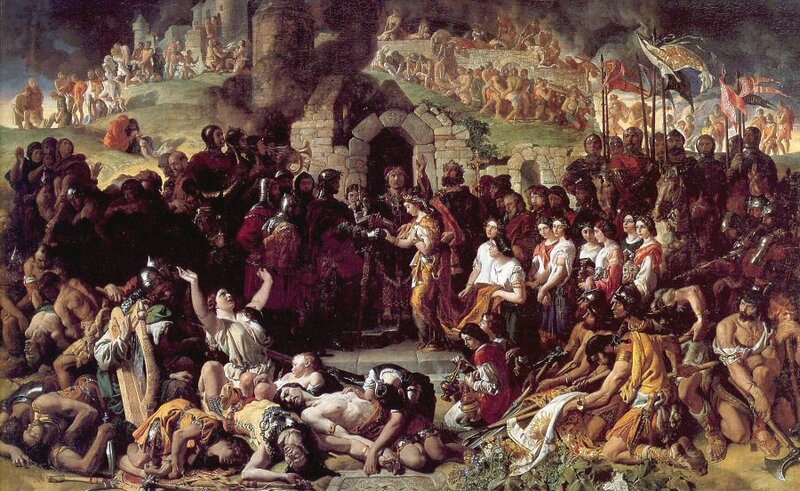 I will be looking at the life of the Irish painter Daniel Maclise and one of his historical paintings which will allow me to take you back in time to the twelfth century and regale you about a happening at that time in Irish History, but first let me tell you a little about the artist. Daniel Maclise was born in Cork in 1806 into a poor but thrifty Scottish Presbyterian family. His father, after leaving the British Army, became a shoemaker. Maclise was educated locally in Cork and attended the Cork Institute where he studied drawing. Whilst still a teenager he was introduced to the art connoisseur, George Newenham, and the antiquarian and merchant, Richard Sainthill and it was through Sainthill that Maclise became interested in medals, coins, and aspects of heraldry and he would often illustrate coin catalogues for Sainthill. In 1825, when he was nineteen years of age, Walter Scott the novelist and playwright visited a local bookstore in Cork and Maclise made a sketch of him which was subsequently lithographed and the copies sold. This was to launch Maclise’s artistic career and enhanced his reputation as a portraitist. Maclise travelled to London in 1827 and started to put together a portfolio of his work which he submitted to the Royal Academy as part of his submission to become a probationary student. He was accepted into the R.A. the following year and stayed on for a further three years during which time he was awarded a silver medal and a gold medal for his historical painting, Choice of Hercules. Whilst in London Maclise mixed in the company of men who appreciated his artistic skills and in particular Dr William Maginn, the founder and editor of Fraser’s Magazine, a general and literary journal for which Maclise contributed portraiture and caricatures. He became a friend of Charles Dickens and contributed a number of book illustrations for his novels. In 1848 he was back in London after a period of time spent in Ireland. He presented a cartoon, sketch, and fresco specimens to the Fine-Art Committee of the Palace of Westminster for their official competition to paint frescoes in the House of Lords. They liked his work and he was chosen to paint The Spirit of Chivalry for the House of Lords in 1848. One year later he painted a companion fresco entitled The Spirit of Justice. His big break came along in 1858 when he was commissioned to paint two giant commemorative frescoes for the Royal Gallery of Westminster Palace, The Meeting of Wellington and Blücher and The Death of Nelson. These two mammoth works were to be the greatest achievement of Maclise’s public career but sadly they were also to cause the deterioration of his health. The two works took Maclise seven years to complete and he worked tirelessly on completing them on time. The passionate and concentrated effort which he put into these two great historic works affected him badly. He would shut himself away and shun his erstwhile friends. The Royal Academy even offered him the Presidency in 1865 but he declined the invitation. His health declined rapidly and in 1870, aged 64, he died of acute pneumonia. My Daily Art Display’s featured painting today by Daniel Maclise is entitled The Marriage of Strongbow and Aoife and was completed in 1854. I suppose the first thing you need to know is who are these two characters, Strongbow and Aoife, and why are they the centre of attention in the painting. Strongbow was the nickname given to Richard de Clare the 2nd Earl of Pembroke who was born in Tonbridge, Kent in 1130. He was a Cambro-Norman knight, that is to say, he was a descendent of the Norman knights who had eventually settled in southern Wales after the 1066 Norman conquest of England by William the Conqueror. He had become the Earl of Pembroke on the death of his father in 1848 and had lands around Pembroke. However fate was to take a hand in his destiny. King Henry I of England died in 1135 and his only surviving offspring was his daughter Matilda, who at the time was pregnant in Normandy with her third child. This gave her cousin Stephen of Blois, grandson of William the Conqueror, the chance he needed to usurp the English throne and he became King Stephen I of England and ruled until his death in 1154. On his death, Matilda’s eldest son Henry was crowned King Henry II of England. Unfortunately for Richard de Clare he made a bad decision in 1135 as instead of supporting Matilda’s claim to the English throne he supported Stephen’s claim and when Matilda’s son became King Henry II of England he took his revenge on Richard de Clare by stripping him of the title of the Earl of Pembroke. Unbeknown to Richard his future lay entwined in what was happening across the Irish Sea as in 1167, Dermot MacMurrough, the king of Leinster, was defeated by Turlough O’ Connor, the king of Connacht. Dermont hastily rushed to England and asked King Henry II for help . Henry could not send troops but asked Dermot to approach Richard de Clare to help him in his war against Roderic. Richard agreed to help on condition that he was allowed to marry Dermont’s daughter, Aoife and succeed Dermont as King of Leinster on his death. With Richard de Clare’s help, Dermot was able to defeat the king of Connacht’s forces, who poorly armed with only slings and stones, where no match for Richard de Clare’s army which relied heavily on Welsh archers, which is why Richard, who was an expert bowman, received the nickname ‘Strongbow’. Richard married Aoife in 1170 and when Dermont died the following year he became the new king of Leinster. However back in England King Henry II was concerned with their power Richard now exerted in Ireland and so in late 1171 Henry and his troops crossed the Irish Sea and Strongbow was forced to surrender Leinster to Henry. The land was later returned to Richard de Clare in return for the service of 100 of his knights. My Daily Art Display featured painting today is the large romantic historical oil painting (309cms x 505cms) entitled The Marriage of Strongbow and Aoife which was completed by Daniel Maclise in 1854 and is housed in the National Gallery of Ireland in Dublin. It depicts the ruins of the captured city of Waterford, which is the setting for the arranged marriage of the daughter of Diarmuid Mac Murrough the King of Leinster to Richard de Clare. In the foreground of the painting we see bodies of the vanquished enemy heaped on top of each other. To the left we see the broken-stringed harp, the instrument which symbolises Ireland. In the central midground we see Richard and Aiofe. The victorious Richard de Clare takes his bride’s hand whilst we see his foot on top of a Celtic cross, symbolising the crushing of the Irish enemy. This would be the start of a long period of subjugation by the English for the people of Ireland. Facing Richard is Aoife, his bride-to-be, behind who stand a line of her bridesmaids. Facing us in the central midground is the local religious dignitary who, with his hand raised heavenwards, blesses the couple. The father of the bride, Diarmuid Mac Murrough, King of Leinster, stands to the right of the priest. In the background above the ruins of the city we see wounded men and bodies being carried away by their colleagues whilst women weep and mourn the loss of their men folk. A truly remarkable painting with so much going on. It is one of those paintings which every time you revisit it, you see something that you had not noticed before.